"SAVE" THOUSANDS OF DOLLARS COMPARED TO REPLACEMENT COSTS!! "TOP NOTCH" QUALITY BACKED BY 5 YEAR WARRANY! 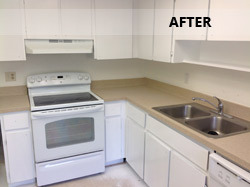 Frank's All Surface Refinishing can provide a valuable service to the maintenance and upkeep of Apartment communities. Because of the excessive wear and tear of renters, the Bathtubs, Kitchen and Bath countertops, and Cabinets need constant upkeep. 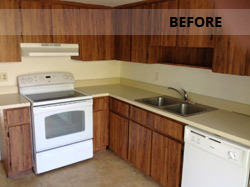 We can provide the most cost effective alternative to replacing Bathtubs and Countertops. We have been working in the apartment community for the last 20 years. We currently have 15 communities that we maintain on an ongoing basis. Many times the Bathtubs are full of rust, or the fiberglass bottoms are cracking. Kitchen Countertops have deep knife cuts and have been abused. We make all of these repairs, so that the owner does not need to incur the high cost of replacement. Frank understands that service and availability are so important in keeping up with the demands of the rental community. If you are a maintenance supervisor or a property manager who is not happy with your current Refinisher, please call us. We can provide numerous references from our current list of Apartment communities. We understand how hectic and demanding this service can be. We will provide the lowest price and maintain a high level of performance. Just call Frank for a Free Estimate! Tile Floors (in bathroom) with multi stone. WE OFFER THE HIGHEST QUALITY WORKMANSHIP. PLEASE MAKE SURE TO CHECK OUT OUR REVIEWS ON ANGIE'S LIST!